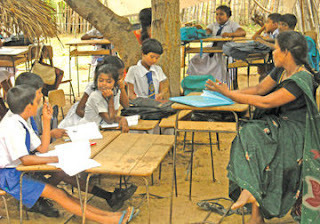 A study released by the United Nations International Children’s Emergency Fund (UNICEF), states that 98% of Sri Lanka’s children of school going age attend schools and there are only 2% of the children who do not attend schools. The Study prepared by the UNICEF was handed over to the Minister of Education Bandula Gunawardana at the Sri Lanka Foundation Institute yesterday by the UNICEF’s Deputy Country Representative Ms Antonia De Meo. As per Ms. Antonia De Meo this is the furst such study carried out by UNICEF in South Asia, which was started in 2010. The study has revealed that that 98.2 per cent of boys and girls in the 5-14 age group (primary and lower secondary levels) and 98.6 per cent in the urban sector, 98.3 per cent in the rural sector are attending schools. Addressing the function the Minister of Education Bandula Gunawardena said Sri Lanka is the only country in the SAARC region with such a high rate of children attending schools and the government intends to make every child to attend school by 2015.